Meghan Arbogast picks up an infant-sized Conduct the Juices shirt for her quick answers to the WTC Trivia Contest. She correctly answered six of the ten questions. Here are my answers to the contest. Thanks to Julie Fingar, RD, Greg Soderlund, past-RD, and all the volunteers for a great race. 1. What are the names of the three creeks you cross on the ALT to ALT loop? American Canyon Creek, Hoboken Creek, and then American Canyon Creek again. 2. Why is the Dead Truck Trail so named? There is indeed an old dead truck on the side of the trail. 3. What’s the name of the trail where Ball Bearing hill is? Maine Bar Trail. In the 1850s there were about 10,000 miners living here and working the river for gold. 4. 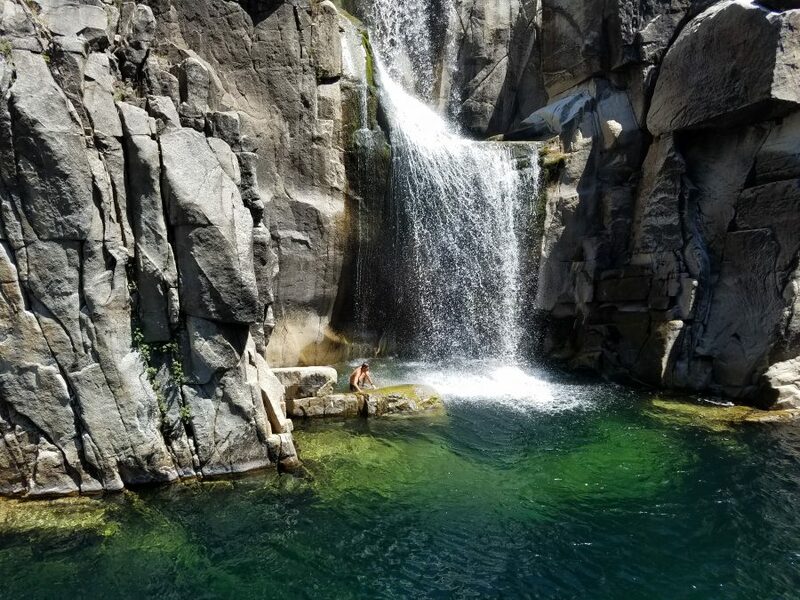 What parts of the WTC course are on the Western States Trail Ride course? There are only two short sections of the WTC course that use the WS Trail Ride course. Unlike the 100 mile runners, the horses cross the river at Poverty Bar. There is a trail that comes up from Poverty Bar and joins the American Canyon Trail just below the bottom of the Dead Truck Trail. The horses follow this past the base of Ball Bearing Hill and stay along the river bottom to the lower quarry. The other short section is along the river bottom between the trail to the upper quarry (what we call 49 crossing) and Brown’s Bar trail (the trail we take at about mile 9). We cover this short section between the first two aid stations. 5. What parts of the WTC course are on the Western States Endurance Run course? In the direction of the WTC race, we get on the WSER course just before you drop down to highway 49 at about mile 6 or 6.5 where there is a junction in the meadow that takes you to Auburn. Once past that junction we’re on the WSER course going in the opposite direction. We continue going the wrong direction past ALT 1 until we get to the Dead Truck Trail. We’re actually very close to the Green Gate when we turn onto Dead Truck. Of course, we double-back on some of that trail on the way back. 6. How can you take 10 minutes off your time on the ALT to ALT loop? A couple miles after ALT 1 we join the American Canyon Trail for just a short ways. There is a very acute turn to continue on the single track of the Wendell Robie Trail. If you don’t take this acute right turn but continue down the American Canyon Trail, you’ll cross the two creeks (American Canyon and Hoboken) just above the confluence and then hit the bottom end of the Dead Truck Trail. This basically cuts out the Dead Truck Trail and is actually a very good trail to run. 7. Who is the Olmstead loop trail named after? Contrary to common folklore, the 9-mile Olmstead Loop Trail is not named after the Dan Olmstead from Eugene who was third in 2008 and second in 2009, but rather a mountain bike advocate also named Dan Olmstead. 8. Where does the paved road that we start on go? The former Auburn Dam site. 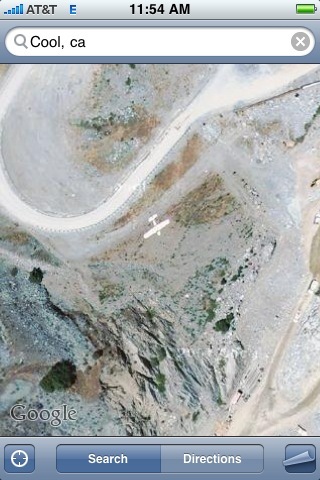 As Gary Wang pointed out there is an airplane on the satellite picture in Google Maps near the site. As proof, he sent me this picture. Has anybody seen the zebras that live down there? 9. Why is there a Barbara Schoener Memorial just east of ALT? In April of 1994, Barbara Schoener, wife and mother of two was fatally injured by a mountain lion. (click here for more). 10. What was the original name of the WTC race? Virginia and Fred have owned the Georgetown Hotel for 13 years. You don’t mess with Viriginia or she’ll grab her Louisville Slugger and kick you out. The Great Ed Willson of Eugene, Oregon managed to charm Virginia into singing Unforgettable with him. It was a sight to behold even with only one eye. That’s just quality in so many ways. Way to go OD! (I would have said something catchy, like “Quality”, but it seems Monkey Boy has a monopoly on that one.) How does your new hoodie feel?! Please forgive me for the late reply – I needed a week to completely integrate the experience. WTC was a bust for me as it turns out, and the weekend would have been difficult if it weren’t for the sweet and charming Virginia. 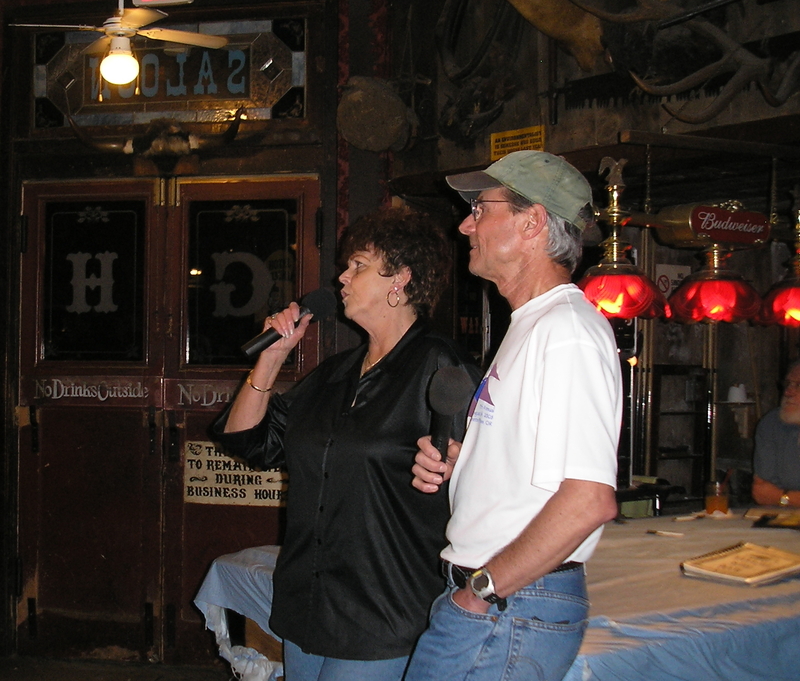 It sure is better to sing with her than it is to have her throw us out of her bar (did she throw me out in 06 for singing that chocolate song?). She and Fred are awesome annual Saturday night hosts, even hanging around for an extra hour to let us satisfy our vocal desires. LB nailed ‘Talk About Me’. AJizzle, you must have felt a discontinuity in the energy stream around 11:00 pm? Speaking of awesome hosts, Carol and Bill put us up again, or maybe it would be better to say: let us invade their house. I think that Carol actually greased the skids for me by telling Virginia that I wasn’t really a creep. Then on Finals Monday (3 of them), I was proud to wear my Juices Hoodie. I think that just being in it kept me laser sharp: Conducting! Thanks LB. « Who Is The Most Underrated Ultrarunner?